The EAP Malta International Athletics meeting will also award Prize Money to the highest performers in both the Male and Female Senior Categories. New EAP record (elite) will be awarded with 300€. The club Pembroke Athleta Athletics & Triathlon Club (P.A.A.T.) 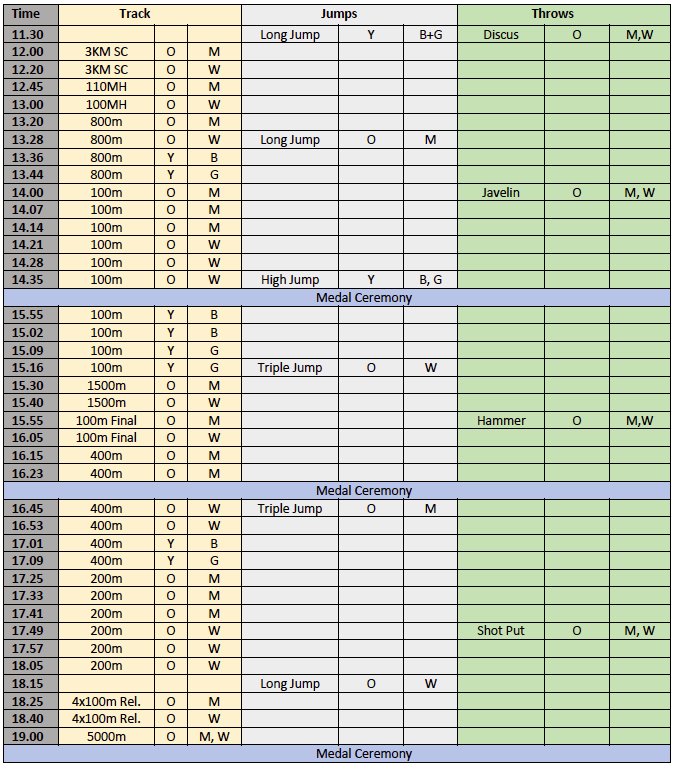 is pleased to announce that newly accepted as a Club Member at the European Athletics Circuit Promotion (EAP). This decision was taken at the 29th Congress of the EAP made at the end of Friday, in France. This decision opens a new chapter in the history of this major club in the area of ​​local athletics, and is part of the implementation of the Program intended Sports Development to raise the level athletes Club Pembroke. This program includes a number of initiatives such as identifying new talent, 'Training Camps, Coaching Clinics, Support scheme Athleti Club Elite, as well as creating new opportunities for the -atleti Pembroke compete f'meetings international athletics outside the country and Malta. 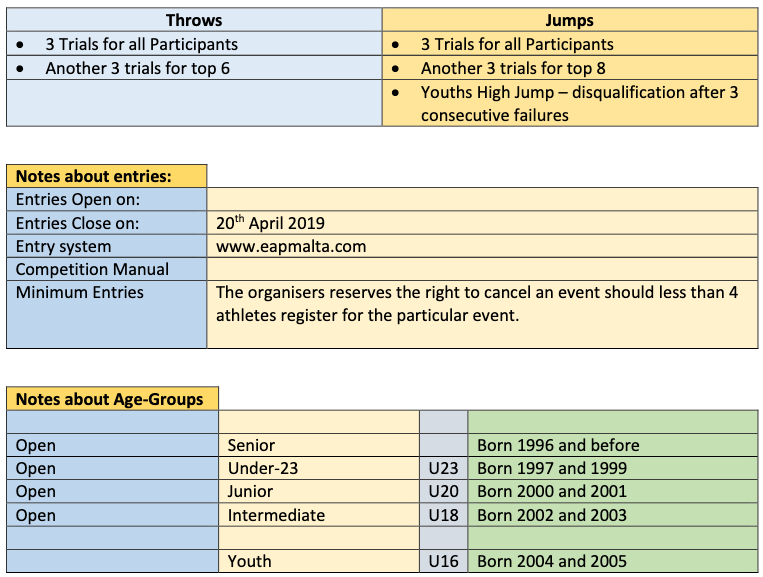 This membership EAP Circuit, presents to both Pembroke Athlete of the right as well as the obligation to host 'Meeting "international athletics, with the first expected to be maintained on Saturday 4 May 2019. The -Sħubija also means that athletes Pembroke athlete will have the opportunity to be invited to participate f'meetings of athletics abroad. 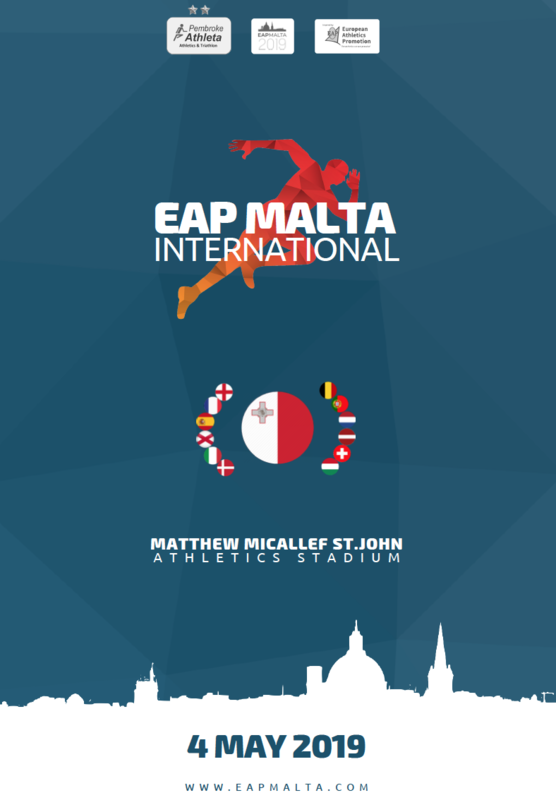 The'Meeting of May following athletes will be open to members of the EAP (Maltese and foreign), other foreign athletes who are not members of the EAP, as well as all local athletes, both in category Youth great as well. Surely the'meeting of Malta following May will help, inter alia, to the Maltese athletes who will form part of the Maltese team for the Small Nations Games in 2019, and can also is the first step for young athletes who aspire to participate in the same game to be held in Malta in 2023. Norman Saliba (Officer) and Steve Camilleri (Athleta), were present at the Congress of the EAP to present the proposal Pembroke athlete for this partnership. Il-Klabb ta’ Pembroke Athleta Athletics & Triathlon Club (P.A.A.T.) bi pjaċir iħabbar li għadhom kemm ġew aċċettati bħala Klabb Membru fil-European Athletics Promotion Circuit (EAP). Din id-deċiżjoni ttieħdet waqt id-29 Kungress ta’ l-EAP li sar fi tmiem il-Ġimgħa, ġewwa Franza. Din id-deċiżjoni tiftaħ kapitlu ġdid fl-istorja ta’ dan il-Klabb ewlieni fil-kamp tal-atletika lokali, u hija parti mill-implimentazzjoni tal-Programm għall-Iżvilupp Sportiv intenzjonat sabiex jgħolli l-livell tal-atleti tal-Klabb ta’ Pembroke. Dan il-programm jinkludi numru ta’ inizzjattivi bħal identifikazzjoni ta’ talenti ġodda, ‘Training Camps’, ‘Coaching Clinics’, skema ta’ Sostenn għall-Athleti Elite tal-Klabb, kif ukoll il-ħolqien ta’ aktar opportunitajiet ġodda sabiex l-atleti ta’ Pembroke jikkompetu f’meetings’ internazzjonali tal-atletika kemm barra mill-Pajjiż kif ukoll f’Malta. Din is-sħubija fl-EAP Circuit, tippreżenta lil-Pembroke Atleta kemm bid-dritt kif ukoll bl-obbligu li jospita ‘Meeting” internazzjonali tal-atletika, bl-ewwel wieħed mistenni jinżamm nhar is-Sibt 4 ta’ Mejju 2019. Is-Sħubija tfisser ukoll li atleti ta’ Pembroke Atleta ser ikollhom l-opportunita’ li jkunu mistiedna sabiex jieħdu sehem f’meetings’ tal-atletika barra minn Malta. Il-‘Meeting’ ta’ Mejju li ġej ser ikun miftuħ għal atleti membri tal-EAP (Maltin u Barranin), atleti oħra barranin li ma humiex membri tal-EAP, kif ukoll għall-atleti lokali kollha, kemm fil-kategorija tal-kbar kif ukoll tal-‘Youths’. Żgur li l-‘meeting’ ta’ Malta f’Mejju li ġej ser jgħin, fost l-oħrajn, lil-atleti Maltin li ser ikunu jiffurmaw parti mit-Tim Malti għal-Logħob tal-Pajjiżi ż-Żgħar 2019, u tista wkoll tkun l-ewwel tarġa għal atleti żgħażagħ li qed jaspiraw li jipparteċipaw f’dawn l-istess logħob li ser isiru f’Malta fl-2023. Norman Saliba (Uffiċċjal) u Steve Camilleri (Athleta), kienu preżenti waqt il-Kungress tal-EAP sabiex jippreżentaw il-proposta ta’ Pembroke Atleta għal din is-sħubija. Pembroke Athleta Athletics & Triathlon forms part of a multi-discipline sports club based at Pembroke Athleta Sports Club in Tunis Road Pembroke and now with additional premises at the ex-parade grounds stadium near the Radisson Blu hotel and Pembroke gardens. Training sessions at Pembroke, Marsa, and Imriehel. This is internationally known as the QUEEN of sport. Disciplines that make up athletics are the jumps, the throws, sprinting and endurance running events. All of us at some time in our life are drawn to these basic physical activities starting at and especially in childhood. The athletics section has girls and boys of all ages training with the club. This sport discipline takes in swimming, cycling and running together. Our Pembroke Athleta tri-athletes train hard to achieve personal bests in all these disciplines. This endurance sport involves team events and relays as well as individual competition, both at short distance and the longer triathlon events. The Olympic triathlon and Iron man are the most popular. Pembroke Athleta has a group of promising, experienced lady and men triathletes coming up. Most of them train with coaches specializing in triathlete events, giving particular attention to their performances. Internationally qualified coaches guide them through their first experience in all the events and later help them to specialize in those events of their choice and aptitude. Becoming an EAP Member presents P.A.A.T. with the right and obligation to host an International Athletics Meeting, with the first one expected to be held on 4thMay 2019. It also presents club athletes with greater and cheaper opportunities to participate in athletics meetings abroad. The 2019 meeting will be open to EAP Members and Non-EAP foreign athletes as well as to all local athletes, and will include an extensive events programme for both Senior and Youth athletes. The Malta meeting will definitely help athletes of Team Malta in their preparation for the 2019 G.S.S.E. and will be a stepping stone for up and coming athletes aspiring to make it to the 2023 G.S.S.E.